37 Volt Cordless Drill - Loaded with power! Sheffield Blades is now the exclusive Australian distributors of the Euroboor range of Magnetic Drilling Machines and Cutters. The gutsy EBM.360, flagship of the Euroboor range is the new standard in cordless mag based drills. No battery powered magnetic drilling machine in the world is as smart as the EBM.360, which combines safety, mobility and power into a single fantastic package. 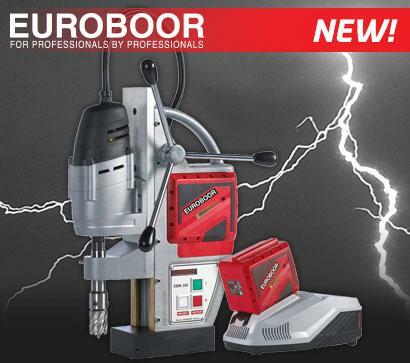 New standard in POWER - The powerful EBM.360 37 V/7.6 Ah Lithium-Ion battery powered magnetic drilling machine is part of the newest generation of magnetic drilling machines by Euroboor. This unique machine's motor and electromagnet are powered by the same energy source without making any concessions when it comes to power and functionality. The 4-pole motor has high torque and a capacity of 506 rpm. The magnetic force of the EBM.360 is 1700 kg/3750 lbs. New standard in SAFETY - The EBM.360 is fitted with a unique sensor technology, thereby making work significantly safer for users and bystanders. New standard in MOBILITY - The EBM.360 guarantees you total freedom of movement, wherever you work. This is partially thanks to its cordless nature and is augmented by the ergonomically sound and compact design of the machine, which means that the EBM.360 is surprisingly light. With all these brilliant features the EBM.360 is hard to ignore. Contact Sheffield Blades today for more information and pricing.